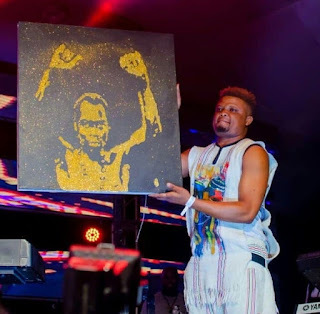 Painting along side Seun Kuti, golden painter, Oniudele Gold made late Fela Anikulapo Kuti gold, creating an artwork never to be forgotten by those who went to honor the legend at the New African Shrine, Lagos. The seven days and yearly celebration well known as Felabration got a feel of Yabatech outstanding talent. Gold was the big goal for the night as made the best and proper of the late legend in less than 15 minutes and best of all, he painted it upside down. The dude is making Nigerian youths proud daily. It must be recalled that Gold was the same artiste who broke the record of First Artist to Paint on Water.